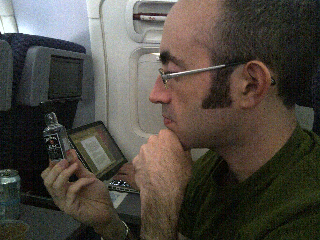 Here I am pondering Jim Beam Black 8yr Bourbon like the Prince of Denmark with Yorick's skull. No official report on this one, though. Due to heavy white noise and low humidity, the olfactory sense is compromised during air travel. A sip of Black Jim neat brought a note of pencils (wood and lead) dipped in corn syrup. So I made a highball with it and called it a day.